1 May 2015 – Students at CAS Elementary School in grades kindergarten through third attended a Sierra Vista Community Chorus production of Disney musical numbers held in the CAS cafeteria. 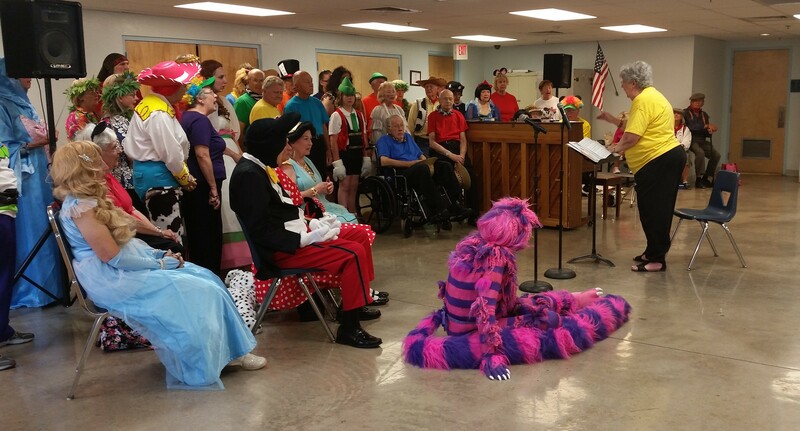 Adult chorus members dressed in Disney character costumes throughout the performance to bring the spirit of fun alive for the kids. Selections included songs from: “Mary Poppins”, “Aladdin”, “The Lion King”, and “101 Dalmatians”. The chorus even brought a trained show dog who participated in the 101 Dalmatians song. Students and parents can enjoy another chance to “sing along” at CAS’s final music performance at 4:00 6 May 2015. The high school and middle school choruses will be performing a variety show of musical numbers. Show will be held in the CAS cafeteria and is open to the public.